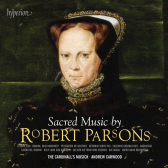 The Cardinall’s Musick return to another master of the Renaissance, Robert Parsons. Very few records remain of the composer’s short life, and his musical output is often overlooked, perhaps in the shadow of the prolific William Byrd, his successor as a Gentleman of the Chapel Royal. However, his vocal writing is some of the most opulent of the period. The Cardinall’s Musick give sublime performances of some of the composer’s most sumptuous choral works, from the remarkably sophisticated Magnificat to the dramatic O bone Jesu. As demonstrated in their previous recordings, their resonant, pure-toned singing is the perfect advocate for such exquisite polyphony. The ensemble’s seemingly effortless and magical performance of the glorious Ave Maria is the perfect conclusion to an enlightening recording.